Notes on the lessons I learned, the people I met, the places I visited, and the adventures I had while teaching in London, England. Growing up, I had been taught not to talk to strangers. After my adventure from Berlin to London yesterday, I am glad that I broke this rule, as I never would have gotten to London safely had it not been for the kindness of strangers, and a whole lot of luck. I had been in Berlin since Tuesday, April 13th. It was the last city I had planned to visit as part of my two week Easter Break before returning back to London on Friday, April 16th so that I could play in my rugby game on Saturday and use the weekend to prepare lessons for a new job I was to start the following Monday. Unfortunately, due to forces beyond my control, namely the disruptions in air transport as a result of volcanic activity in Iceland, I missed my rugby game and showed up to work today completely unprepared and exhausted (but at least I went- 17 teachers were absent from school as they were stuck in other countries!). Due to the dangers of flying through volcanic ash clouds, my flight was cancelled and rescheduled until Tuesday morning at 9:35 am. I was a little annoyed and stressed: I would have to spend an extra four nights in Berlin and would miss two days of work. Since I work for a teaching agency as a temporary worker, I do not get compensated for days I miss from work. By missing two days, I would have difficulty paying my rent for May, since I had essentially spent all my money during my two week holiday and was relying on a full week of work for my next paycheck. In order to avoid complete financial anxiety, I telephoned my parents on Skype from an internet café in Berlin to see if it would be okay if I borrowed some money from them in case my personal funds ran out as a result of the extra travel expenses I would incur. Luckily, my parents are very supportive and in a position to be able to help me out whenever I need it and agreed to transfer money into my Canadian account if required. Having to ask my parents for money was worse than the feeling of being stuck in another country, as for me, it felt like a complete loss of independence. Even though I lived on the brink of existence financially, I had done well managing my money and budgeting so far this year- but I had not anticipated needing an emergency natural disaster fund. Neither did most other travelers, as I soon learned. I am very fortunate that I have people who I can go to for help when I need it, but there are many stranded travelers who are sleeping in airports and train stations, and who are probably starving due unplanned expenses. My friend, Nita, who I was travelling with told me that she thought that what I needed to learn from the “being stuck in Berlin” fiasco was that it is okay to ask for help when I need it and that I won’t be able be self-sufficient all the time- that I will need the support of others from time to time. She is probably right. On Friday and Saturday, I tried to take advantage of having more time to experience Berlin. It is ironic that on Thursday I had told Nita how I wished that we had booked a longer vacation, as I didn’t think I would be able to see everything I wanted to. Although I was appreciating the extended holiday, by Saturday night, the news reports were predicting that flights might not resume for another week or so, and I became a bit panicked. Would my flight be cancelled Tuesday? If it was, when would I be able to leave? I decided that I could not wait any longer. I needed to feel as though I was doing everything I could to get back to London. Who knew how long the volcanic activity would last? On Sunday morning, I went to the train station in Berlin to see what my options were. Nita decided to wait in Berlin until Tuesday and see if she could get on our scheduled flight before taking action to travel by land. This meant that I was travelling alone. I was also without a cell phone, which I had stupidly left at my friend Angela’s on my trip to visit her in Brussels a few days earlier. I thought that I would probably travel to Calais, France, and then try to take the ferry from Calais to Dover, England. When I got to the train station, I realized that my best option was to take a train to Brussels, Belgium, via Cologne, Germany and either take the Eurostar or coach bus through the Channel Tunnel to London. I knew that both the Eurostar and bus were sold out and that I would probably have to spend a few days in Belgium before I could travel onwards to England. Since Angela lived in Brussels and I knew I would be able to stay with her family if I needed to, I decided to go there instead of France. Unfortunately, I did not have her number. It was saved on my phone- in her house! I did not have enough time to e-mail her either. The next train to Cologne was to leave in ten minutes. I was alone and not really sure where I was going, or what I was getting myself into. All I could do was hope that everything would work out. I had to stand on the train from Berlin to Cologne since I had bought my ticket last minute (and paid 140 Euros. Eww.). However, this turned out to be a blessing because I met Geraldine and Patrick, an Irish couple who were trying to get to Ireland from Berlin, and Bryan, another Irishman who was trying to get to Dublin from Poland, and had already had quite the adventure before we met him. Bryan was in communication via text with his wife, who was researching our options online, and Geraldine was in similar contact with her daughter. Although I was cellphone-less I had my Lonely Planet guide, “Europe on a Shoestring”, which proved to be a valuable resource in providing them with ferry options to various places in the UK, as well as to Ireland. The four of us instantly became friends and talked non-stop about our lives and backgrounds, which made the uncertainty of getting home and travelling alone less scary. I was no longer by myself. When we arrived in Cologne, the train was overbooked and we had to get on a bus to Brussels. The four of us stuck together to make sure that we all got on the bus. By the time we were nearing Brussels, Geraldine, Patrick, and Bryan had all been booked into hotels by their families and were very worried about what would happen to me once I got to Brussels. My plan was to find an internet café (if I couldn’t get the bus or the Eurostar, which were both extremely unlikely options) and e-mail Angela in hopes that she would get back to me soon. Geraldine and Patrick insisted that I stay with them if I was not able to get in touch with her, as they did not like the idea of me staying on my own. The internet café at Brussels Midi Station was closed. This completely baffled me: with so many people stranded at the station it was a good opportunity for the business to make money! I wandered around the station in search of internet options and started to get a little bit nervous. Perhaps I would have to spend the night in Geraldine and Patrick’s hotel room after all. As I shuffled through the crowds of tired and frustrated passengers hoping to get on the Eurostar stand-by, I saw a familiar face: my friend Anna, another Canadian teacher who lived on my floor in residence in London! What a relief to see someone I knew. Anna: How are you going back to London? Me: No clue. I am currently trying to find an internet café in hopes of getting in touch with a friend who lives in Brussels. I’ll probably be here a few days. Anna: I have an extra Eurostar ticket for a train to London tonight. Do you want it? Was she joking? Did I hear her properly? Looking at the hundreds of people hoping to get on a train at some point in the next couple of days, let alone tonight, I realized I had literally hit the jackpot. Even more unbelievable was how Anna came to have an extra Eurostar ticket. She booked the Eurostar the previous Thursday after she decided to head back to London from Amsterdam via Brussels on Sunday. However, while she was booking her ticket, her session timed out. This was after she had entered her credit card information. She thought that her credit card wasn’t working, so her friend, Ashley, another Canadian teacher whom Anna was travelling with, booked tickets for the both of them. Later on, Anna got an e-mail from Eurostar confirming that she had a spot on the train she thought that she had not booked for Sunday. Therefore, Anna and Ashley had three tickets between the two of them- by accident. I ran into them as they were waiting in line to see if they could get a refund for the extra ticket. What are the chances?! Miracles really do happen. Thank you, Anna. Thank you, Guardian Angel! The whole trip to Berlin was an emotional roller-coaster. In addition to the stress imposed by the looming uncertainty of how and when I would return to London, I had been feeling a little disheartened when I was sight-seeing. Reminders of terrible events in history, through visits to the Berlin Wall, Checkpoint Charlie, the Holocaust Memorial, and Sachsenhausen Concentration Camp, made me reflect on the dark side of human nature and the root of evil. Fortunately, my faith in reality was restored when I saw people coming together to ensure that complete strangers were able to get home safely. I would like to thank Bryan, Geraldine, and Patrick, who really took care of me on the journey from Berlin to Brussels. It was amazing how quickly we became a team and helped each other out. I hope that you are all able to get back to Ireland safely! I would also like to thank Chris and Oliver, who allowed Nita and I to stay for free in the flat that we had rented from them for our first three nights in Berlin, once we learned that our flight had been cancelled, forcing us to stay in Berlin longer than planned. Otherwise, we would have had to pay for 4 extra night’s accommodation. They were also incredible hosts and went out of their way to ensure that we were taken care of while in Berlin. Future travelers, please let me know if you need somewhere to stay in Berlin. Their flats are really nice and in great locations! The chaos and disruptions created by the volcanic eruptions made me realize how much we take the power of nature for granted. No matter how hard we try to control our lives, we are completely helpless to random acts of nature, or “Acts of God”, as some airlines and insurance companies are using as justification for not having to pay their passengers’ expenses while they wait for a rescheduled flight. It has also made me think a lot about the existence of fate and fortune. I still cannot believe that I bumped into Anna in a busy train station in another country and that she had accidently booked herself into 2 seats on the sold-out Eurostar. I told the students at my new school that the universe had somehow enabled me to teach their lessons this week, so that they better behave as to avoid bad karma! Unfortunately, this only tamed them for a little while! I also did not know much about Iceland before this experience, and certainly did not know that it had any volcanoes. I guess the whole world does now!!! Good luck to all of my friends who are stuck in Greece, India, Egypt, Thailand, Spain, Morocco, and elsewhere in the world. Stay positive: miracles can happen! A few weeks ago, I went to Oslo, Norway, with my friend, Mel, an Australian who I met on my ski trip in France. It was a jam-packed weekend, as we tried to squeeze all of the sights into two days, but definitely worth it. Our decision to go to Oslo was a little spontaneous. I was having an incredibly rough day at work (but now can’t remember what even happened, so it mustn’t have been that bad! ), and started browsing the Ryan Air website to get myself excited about my next adventure. The wonderful thing about teaching in London is that your next holiday is always less than 6 weeks away, so whenever you have a bad day, you can always start dreaming about your upcoming vacation. While I was searching for flight prices for weekends I had off rugby, I came across a flight deal to Oslo: 5 pounds each way! What a bargain. This would be a cheap weekend getaway, I had thought. How wrong I was! Oslo is ridiculously expensive. I still feel sick at how much money I spent in a single weekend. Oh well, when in Oslo…This experience taught me that a cheap flight does not equal a cheap trip and I will be a little more cautious as to where I go for budget vacations. In hindsight, however, I am not upset I spent so much money in Oslo, as I did enjoy my time there and learned a lot about Norwegian history and culture. As a result of my confusion in converting currency, I did not initially realize how expensive Oslo was, especially for food. Norway’s currency is the Norwegian krone (NOK). One British Pound is approximately 9 NOK (and 1 Canadian dollar is just less than 6 NOK), which is a little disorienting when trying to figure out the value of items. Mel and I were being pretty frugal in where we ate, but what is usually considered cheap food in London ended up being quite pricey. For example, we ate at Burger King, which I paid for on my credit card. I was shocked when I looked at my statement. A simple burger, drink, and fries combo ended up costing 13 pounds, which converts to over 20 dollars Canadian. Yikes…and this was a cheaper meal! It was also funny when I withdrew 200 NOK from an ATM thinking that it was alot of money, when it was really less than 25 pounds. This being said, I felt foolishly rich when I had 500 NOK in my possession (less than 60 pounds). We arrived in Oslo late Friday night, checked into our hostel and went on a wander around the city. My first impressions of Oslo were really good: it seemed lively and cosmopolitan and the people were really friendly. Also, as it was the first place I have been to where I did not understand the first language (Norwegian), I was a little taken aback by the fact that many signs were meaningless to me. Everything was written in Norwegian (although most signs, menus, and brochures are also written in English)! Luckily, most people spoke English fluently so we did not have much difficulty communicating. On Saturday, we ate what I now realize was a very overpriced breakfast at the hostel and went for a walk around the city. Our first stop was the tourist information center, where we bought a 48-hour tourist pass, which granted entry to most of the major attractions and allowed for unlimited access on public transport. I would highly recommend the tourist pass to anyone planning on visiting Oslo in the future. It is definitely good value for what it offers and forces you to see as much as you can. The public transport system is also efficient and user-friendly and we ended up using it a lot. On Saturday morning, we visited the Norway Opera House (which Mel was not too impressed by since it apparently did not compare to the Sydney Opera House), and walked around the medieval Akershus Castle. We later stumbled across “The Mini Bottle Gallery” en route to the Nobel Peace Center. This bizarrely delightful gallery is basically a collection of over 50 000 mini bottles and ended up being the highlight of the trip. I thought that it was quite funny (and reflective of today’s youth-haha) that we spent so much time in what could be considered a silly, meaningless exhibit during the time we had intended to spend in a very serious and meaningful one. When we were finally able to pull ourselves away from the mini bottles, we went to the Nobel Peace Center, as planned, and it was incredible. There was a very moving exhibit, “From King to Obama” which portrayed how the work of 1964 Nobel Peace Prize winner, Martin Luther King, Jr., in the American Civil rights movement helped create an opportunity for Barrack Obama, this year’s Nobel Peace Prize winner, to become President of the United States. In the afternoon, we had a late lunch at the waterfront and enjoyed the view of the harbor. Afterwards, we walked through the Vigelandsparken Sculpture Park, which contains walkways lined with 192 bronze and granite statues of naked and obviously passionate lovers, naked screaming babies, naked affectionate elderly people, and most centrally displayed, a 14-meter phallic-like column consisting of 121 entwined naked human figures. All the sculptures were carved by Norwegian sculptor Gustav Vigeland (1869-1943) and I would have liked to know what his intentions were when he created the park because I simply didn’t get it. On Sunday, we took the subway and a bus to Holmenkollen Ski Park, where we saw the newly rebuilt ski jump and visited the ski museum. There was actually a biathlon competition going on that day, so it was neat to see all of the fans dressed up in their country’s colours and waving flags to support their athletes. Later on, we went to the Bygdoy peninsula, which is located just outside the city center, and visited the Viking Ship Museum and the Norsk Folkemuseum. The Viking Ship Museum is really impressive, as it showcases three 9th century Viking ships which are in surprisingly good condition. By the time we got to the Norsk Folkemuseum, I was feeling pretty exhausted from all the sight-seeing so did not really appreciate it as much as I could have. The aspect of Oslo that I loved the most was its proximity to the wilderness. In fact, this made me a little homesick, as it reminded me of all of the outdoor activities that I participate in regularly in Canada. Although London has many beautiful parks to run and cycle in, I often crave the beauty of the great outdoors. Oslo is in an amazing location. 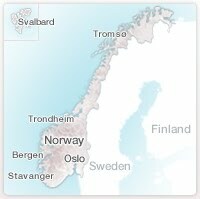 It lies at the tip of a fjord and is surrounded by forests and mountains. It was common to see people with their skis on the subway, as the public transportation system in Oslo connects people with a few ski hills and an extensive network of cross-country ski trails. It was too bad that we were only there for a weekend because we did not have time to both ski and see the sights. While we were there, I made a tentative plan to go back the following weekend to do some cross-country skiing…unfortunately, the one weekend ended up being too expensive to justify a second trip. I really would love to go back to Norway in the summer and venture north to do some camping and hiking. Despite the fact that my weekend in Oslo did major damage to my bank account and made me a little homesick, I absolutely loved it. I could really see myself living in a place like Oslo forever, as I appreciated the culture, the arts, and the opportunities it offered for healthy, active living. I guess it is a good thing that I enjoyed it so much, because it reminded me a lot of Canada! Hopefully, I’ll be able to go back at some point to take advantage of the outdoor activities…but next time I go for a weekend, I’ll budget for a week! Would I be Happier as a “Lifty”? The first time I saw mountains was in Banff National Park. I was 14 and completely mystified. To this day, my family makes fun of my romantic reaction to the sight of them. “I am overwhelmed by the magnitude of the mountains”, I said out of both awe and infatuation. What a geeky thing to say. Oh well, I was in love. Since then, I have always felt a strong pull to the mountains. I am not sure exactly why I am so captivated by them; perhaps it is the striking presence of both danger and beauty, the draw to push myself beyond my limits, or the harsh reminder of my insignificance in nature. Whatever the reason, whenever I am surrounded by mountains I am always dominated by one feeling: freedom. 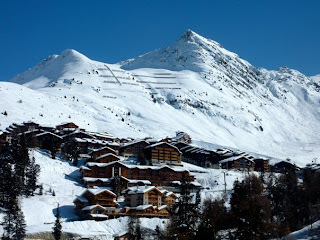 Over my February Half Term Break from school, I had my first experience with European mountains, the Alps, at La Plagne Ski Resort in Savoie, France. With altitudes between 1250 and 3250 m, 225 km of skiable terrain, and stunning scenery, it was definitely worth the 18 hour bus ride from London. I signed up for an organized group trip with two Canadian teachers who I have been lucky to have become friends with in London. Taking part in the group trip turned out to be a great decision, as we were able to meet other travelling teachers (mostly Australian) to share experiences with, and have a great group of people to hang out with both on and off the slopes. It was an amazing 6 days of skiing with pretty good conditions and blue skies for most of the trip. Unfortunately, the biggest dump of snow was on the day we left, so we didn’t have the opportunity to ski any fresh powder, but luckily, I was able to find enough good snow anyways. While I was there, I tried hard not to think about returning to London. Although I do really like London, my love for the mountains made me dread going back to the grind of city life. Despite the fact that my current status as a teacher in London has its perks: lots of vacation time, the opportunity to live in one of the world’s greatest cities, gaining valuable experience in the classroom, it has also been a test of my resilience, as I constantly feel as though I give and give and give to very needy students and inadequate systems with minimal return for my investment. This being said, I seriously contemplated getting a job as a ski-lift operator and staying in La Plagne for the rest of the year (or the rest of my life). Truthfully, I think that the only thing that held me back was that so many of my personal belongings were in London. The whole debate makes me question why so many people choose to live in the city instead of the mountains. I suppose it all goes down to a feeling of usefulness. In the city, there is more opportunity to contribute to something greater than oneself. For me, living in the mountains would simply be blissful ignorance. After having been exposed to so many social problems from my experience teaching in London, such as child poverty and homelessness, dysfunctional families, gang violence and bullying, inadequate resources and funding in inner-city schools resulting in student underachievement and staff burnout, it is hard to walk away without doing something to help. This being said, I think I would feel too guilty in the mountains to really enjoy it. Unfortunately, with the guilt also comes the feeling of overwhelming helplessness: the problems are politically and institutionally rooted- what can I really do to make things better? Maybe I would be happier working as a ski lift operator, but I am guessing that eventually I would get tired of doing the same thing everyday, and develop an itch to do “more” with myself. At least the mountains will always be there for a temporary escape; a chance to appreciate the world’s beauty and forget about the often troubling realities of city life. Such is my excuse for not posting anything on my blog for the last (gulp) two months. I apologize to the wide readership of my parents, brother(s)? and aunts. One of the things that I love most about skiing is riding the chair-lifts. At least on chair-lifts in Canada, it is acceptable, if not expected, to chat with the strangers beside you. The ascents are usually only 10-15 minutes in duration, so conversations typically cover the standard: Where are you from? How long are you here for? How are the conditions on this or that run? Are those powder skis you’ve got? Pretty fancy. These brief exchanges are not intended to lead to lasting relationships; rather, they are simply friendly conversation. However, they are almost always pleasant and can even improve your day by providing you with tips on how to make the most out of your skiing experience. Such is not the case on the London Underground, or “the Tube”, where passengers tend to mutually ignore each other. In December, 2009, The London Assembly’s Transport Committee’s report, Too Close For Comfort, found that some trains carry more than four people per square meter during peak morning hours. During rush hour, passengers are often physically pressed up against each other, yet usually abstain from acknowledging the other members of their intimate human sandwich; for on the tube, eye contact is one of the most deadly sins. There are a few common techniques that people use to help them avoid human interaction on the Tube. The first, and most common, is reading. I always bring a book with me, but for those who arrive at the station ill-equipped, free newspapers like the Evening Standard or the Metro function as excellent shields from the wandering gazes of deviant passengers. It is also important to step into the tube carriage with some form of literature so that you don’t risk breaking another cardinal Tube sin: reading over someone else’s shoulder. Another popular technique of social avoidance on the Tube is listening to iPods. In my opinion, this strategy provides greater invisibility than reading: not only can you avoid looking at people, you can avoid listening to them (well, the few who actually speak). Listening to music, audio books, podcasts, and other programs helps passengers zone out of their stressful physical environment and tune into the world of their digital media. iPhones give users an even greater sense of public absenteeism on the Tube. They enable passengers to write drafts of emails (there is minimal internet service underground), play games, listen to music. I find it ironic that users of iPhones avoid socializing on the Tube as this technology enables them to be incredibly socially connected above ground. A more controversial method of anti-social behavior in the London Underground is eating. This is probably the least used strategy. The Tube hosts a high volume of passengers, and is, thus, not the cleanest place to eat a meal. However, it is an effective way of repelling other passengers: some people are so disgusted with even the idea of eating in such a germ-filled environment that they completely ignore you. I am not sure why passengers try so hard to avoid human interaction on the Tube. As someone who enjoys talking to strangers and making new friends, I am always baffled by the social anxiety I feel when I enter a London Underground station. I think that part of the reason we are so anti-social on the Tube is simply being underground, which causes us to feel trapped and suffocated. In addition, once we step into a carriage, we lose complete control of the efficiency and duration of our journey. Problems such as delays, communication failures, and overcrowding are not up to us to solve. All we can do is accept that we are going to get there when we get there. Regardless of the reasons why passengers snub each other on the Tube, it often makes for an unpleasant and uncomfortable experience. Instead of going to work keen and energized, I often feel panicked and stressed out. Although the London Underground is an amazing system of mass transport, I wish that it could be a little friendlier. I think that if the social experience of taking the Tube was more like riding a chair-lift, London would be an even more productive city: people would come to work feeling healthier and happier, and may even pick up a tip or two to improve their job performance! Are you offended when someone calls you American? Does McDonald’s (actually they pronounce it MAC- Donald’s) taste better in America? Students seem much more fascinated with “America” than Canada. After having been asked so many times, I looked him up and discovered that he is a Canadian actor and hip-hop artist (and, seemingly, the most famous Canadian celebrity among British youth). Do you know Mr./Mrs.________ (Canadian teacher at their school)? Do you have school in the winter in Canada? Can you say something in “Canadian”? Have you seen a polar bear? Are you Janine from “East Enders”? I have been asked this question several times now. “East Enders” is a popular television series here. I have never seen it, but apparently the students at my new school think that I am the actor that plays one of the characters on the show…despite the fact that she speaks with a British accent. Were you on “One Tree Hill”? After speaking with another Canadian supply teacher who has also been mistaken for an actor, I am guessing that they somehow equate our "American accents" with Hollywood. I find it hilarious how little most Londoners know about Canada. But if you think about it, I didn’t know a whole lot about England before I came here! Is living in London expensive? Yes. Yes. Yes. Have I saved anything? Absolutely not. Will I save anything? Probably not. However, I make enough to be able to travel on my breaks, chip away at my student loan, and live semi-comfortably in London. I came here to learn and explore, so I am not really concerned about saving- just as long as I don’t go into more debt than I started with, I am happy. Truthfully, I don’t find living in London much more expensive than it was to live in Toronto (where I spent a year while completing my B.Ed. at U of T). The reality is, big cities are expensive, but they also have a lot to offer that smaller cities or towns do not: vibrant multicultural communities, a lively scene of art, culture, and entertainment, an opportunity to participate in anything and everything, and the constant buzz of excitement and struggle- the exhausting rush of so many people trying to “make it in the big city”. Since there are so many shops, pubs, shows, and things to see and do, it is easy to spend an entire paycheck before you get the next one. However, you can actually live pretty cheaply here if you try: it is all dependent on what you value and how you want to spend your money. If you eat out all of the time, never pack your lunches, buy lots of drinks at the pubs, and go shopping a lot, you will have difficulty even surviving in London. But if you take the time to live a little more frugally, you will be fine. It just takes a while to figure out how. For example, I had initially been spending a lot more than I needed to on transportation. I had been using a “pay as you go” Oyster Card for the tube and paying regular fare for trains. Even though it is cheaper to use an Oyster Card than it is to pay normal tube fares, it added up. Payment for the London Transportation System is based on how many “zones” (1-9) that you travel through. It is often faster to travel to the suburbs via train, but it is also more expensive. However, what I didn’t initially realize is that you can purchase “Travel Cards” that give you unlimited travel on the London Underground (tube), National Rail (train), and buses between certain zones. When I was supply teaching, I had difficulty anticipating my travel costs because I never knew where I would be travelling to. Usually, the schools I worked at were in Zones 1-3, but on a few occasions, I also worked at schools in Zones 4 and 5. Since I was normally called in less than an hour before school started, I needed to get to the school as fast as I possible could. This meant taking the train. The costs definitely added up. Now that I have the transportation system all figured out, have a permanent job at the same school every day, and have developed more of a consistent routine, I use a Zone 1-2 Travel Card which costs £25.80/week, or £99.10/month. In the spring, I might just start riding my bike to work (it is about a 30 min bike ride), which would save me quite a bit of money. When you were supply teaching, did you get lost trying to find the schools? I never got lost once on my way to work. Travelling in London is pretty straightforward once you understand how to read the Tube map. Directions and names of stops are all clearly indicated in the stations; all you have to do is make sure that you take the time to stop and read them. My agency was really good about providing me with clear directions from my residence. They would usually text me the specific directions as I was in transit so that I would not waste time figuring out how to get to where I was going. I also always brought a London “A-Z” map with me, so if I was ever unsure of my location, I would just look up surrounding street names to orient myself. Have you done much travelling? I have not done as much travelling as I had hoped, but have some exciting trips lined up for the rest of the year: weekend in Belgium, skiing in the Alps, rugby tour to Ireland, travelling through Spain and Portugal, cycling in Italy...and, hopefully, more to be scheduled. For the first part of the year, I was focused more on setting up my life in London than I was in leaving the city. The highlights, however, were definitely my trip to Dublin over the October half-term, and to Paris on my birthday weekend. I have explored England a little bit, as I have been to Bristol (where my good friend, Angela, goes to University), Bath (to see the “Roman Baths”), Salisbury (to see Stonehenge), Brighton, and have cycled through much of Kent. Are the students badly behaved? I have been in some classes which have been absolute nightmares, but have also been in some really nice classes. There have been moments where I have done everything in my power not to cry and have been moments when I have really had fun with my job. The worst experience I had was when a student told me to “shut the #$&%# up”, refused to leave the class when I told him to get out, and then hid under a desk and started chucking paper balls at the rest of the students. Although this was a horrible experience for me, I found the time when a girl took a hair straightener out of her purse, plugged it in and started straightening her hair in the middle of gym class much more disappointing. I find the hard part about managing students here compared to back home, is that you are completely on your own. I haven’t been in any schools that have intercoms or “P.A.” systems. Therefore, if students get into a fist fight in class (which has happened at least 3 times so far), it is hard for me to contact other authorities. All you can really do is send a student to get “someone”, usually their “Head of Year”. It has definitely been hard and frustrating at times, but I am hoping that dealing with such crazy classes now will make future teaching experiences much easier. The weather in September and October was pretty comparable to how it is in Canada during those months. In November and December, it rained A LOT, but it wasn’t that cold. It felt like late October in Canada. The temperatures in January are normally above zero, but this past week, it snowed! It is rare for London to get any snow, but we got about 10 cm. The city was in a complete panic! It was really interesting to see the chaos that was created over such a small amount of snow, but understandable considering that there are not the systems in place here to effectively deal with snow removal and people are not used to driving and walking in snowy conditions. I literally saw people walking sideways on the sidewalks because they didn’t know how to walk across the ice! Many schools closed, but mine remained open. However, only about half the students were there (even though they all walk to school…those slippery sidewalks!). The snowball fight at lunch was a full-out, school-wide war! Although it was complete craziness in the school yard, it was cute to see the students having so much fun in the snow, and makes me realize how much we take our seasons for granted in Canada. Do people make fun of your accent? Yes. They notice my “American” accent right away, and the students particularly, get a kick out of some of the terms and expressions I use (see my British/Canadian dictionary), but I think they actually like learning the differences in our vocabulary. Have other questions? Don’t hesitate to contact me or leave a comment. British/Canadian Dictionary- words as I learn 'em! I am a Canadian teacher who has been living and working in London, England since September, 2009. Subscribe To "Bangers 'n Mash"